Nowadays, LED or light-emitting diode products are becoming widely held due to its low power consumption and low maintenance. In fact, these LED products are becoming the selected products used for status signals. LED products offer countless advantages such as long life, high efficiency, and resistance to shaking, and the capability to be simply turned on and off using electrical circuits instantly. These advantages make the brightness and pulsing control somewhat easy on behalf of LED signals. In addition, several colours of LED are currently available in the market. The main reason why LED comes in various colours is to have a distinct unit with several colours being produced from a particular enclosure and it is a great substitute rather than having three separate beacons since it is very hard to achieve using filament spotlights or other light sources. Nonetheless, we mentioned the term Status Signals – if you’re not familiar with this then let us define what they are. A Status Signal is a type of guiding light or beacon that has more than two colours to indicate the changing position of a situation, machine, process, and more. The normal colours of a status beacon or signal, are red or green and red, green, or amber for a three colour status indicator. 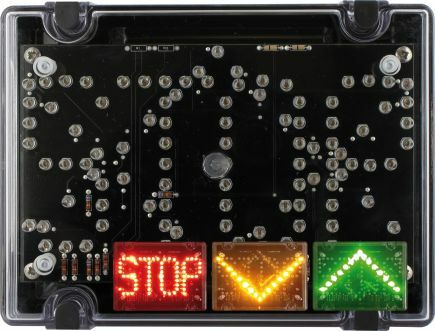 LED Status Signals can come in several different forms – a Tower type unit, Traffic Light, or simply instructive Text displays. Despite how it is presented, these indicators are put in place to increase efficiency and safety, by notifying us of the status of a situation, or by telling us what we should and should not do. In addition, these Status Signals are perfectly well-matched to a wide range of applications, such as On-Site Traffic Management, Loading-Bay Indicating, Factory Control, Shutter Door Status, Stop Signalling, Fire Alarm Notice, and more. What is the Significance of LED Status Signals? As already explained, LED status signals are very important since it can show whether your device is working and functioning well or there is something wrong with it. But aside from that, LED status signals are essential because they offer a wide variety of advantages. In terms of traffic lights, LED status signals play a significant role particularly in the safety of pedestrians and drivers. The LED lights found in the traffic lights affect the efficiency and the safety of the traffic as well as the pedestrians. Traffic lights are composed of three different colours (red, yellow, and green) and they indicate a different meaning. – RED – this signal light indicates STOP but you are allowed to turn right if there is no pedestrians or vehicles in your way. – RED ARROW – it also means STOP but you are not allowed to turn right. – AMBER – this colour warns you that red signal or STOP sign is approaching. So if you already saw this colour you need to stop for your own safety. – GREEN – A green LED light means GO, but before you proceed make sure that there is no pedestrians or even vehicles left behind at the intersection. – TRAFFIC SIGNAL IS SHUTDOWN – if traffic lights are not functioning due to power failure, you should stop at the junction and check if there is an approaching pedestrian or vehicle. The Stacking LED modules are more suited to this application, to increase efficiency for example, on production lines to indicate machine fault. No matter which aspect we look at, LED Status Signals are commonly used and play an important role, especially now that LED products are rapidly growing and becoming increasingly popular.